This is a mature but pleasant site in a superb hilltop situation offering wonderful views over Florence. The 120 pitches, all with 5A electricity, are on terraces and steep walks to and from the various facilities could cause problems for guests with mobility problems. There is shade in many parts. The pool is on the upper level along with the restaurant/bar, and the views are really stunning. Some evenings you can hear music from the nearby Roman amphitheatre famous for its classical entertainment in summer. Pitches are separated; motorhomes and caravans in the upper area and tents on the lower terraces. 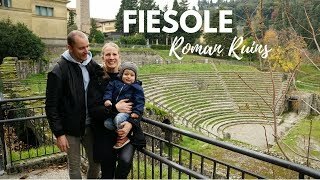 Fiesole itself is interesting, its history predating that of Florence. It was founded in the 7th century BC when the Estruscan colony here was a powerful force in Italy. The site is appreciably fresher and quieter than nearer the very busy city. A shuttle bus service operates one way from the site to the centre of town (08.30-11.45 and 14.00-16.45 on request) to connect with the service to Florence (tickets from site office). However, it is an extremely long uphill walk back to the campsite from the town and thus the local bus (to within 300 m) or a taxi may be useful. Two tastefully refurbished toilet blocks have mainly British style WCs, free hot water in washbasins and good showers. Washing machines and dryers. Fridges, freezer, microwaves, irons and little cookers for campers’ use. Shop (1/4-31/10). Bar and restaurant (1/4-31/10). Swimming pool (1/6-30/9). Play area. Nursery. Torches required in some parts. English is spoken. Free shuttle service to Fiesole. WiFi on part of site (charged). From A1 take Firenze-Sud exit and follow signs to Fiesole. From Fiesole centre follow SP54 and camping signs which should keep you out of the town centre as its roads are very narrow for large units. Take care on the last part of your journey up a steep access road to the site. Do not use sat nav.